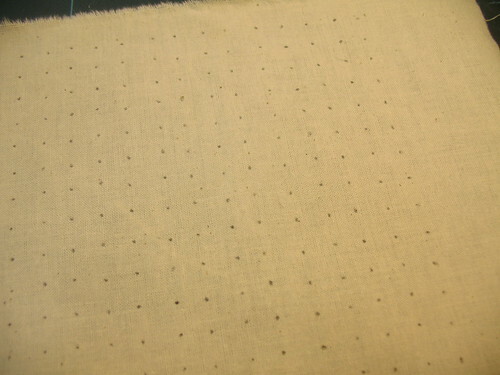 Start with drawing a net of dots on your fabric, I do the dots directly on the fabric but many makes a paper patterns with squares first, and then uses the corner of the squares to mark out the dots. my squares are 1*1 cm (0,4 inches), it is a bit small to work with, so if it is your fist try it can be good to start with some larger squares such as 2*2 cm (0,8 inches). 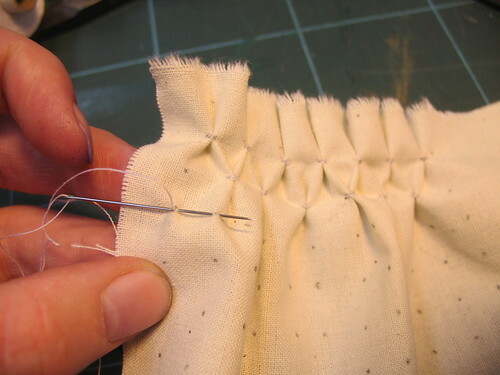 With a lot of smocking techniques one usually marks on the back of the fabric, but now we mark on the front. You need a needle on a thread that is knotted in the end. Stick the needle up in the first dot. 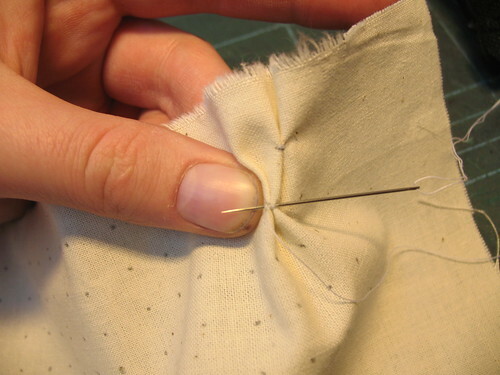 At the same place, pick up a few millimetres of fabric (just like 3 threads or so). Go to the dot beside it and pick up some fabric here to. 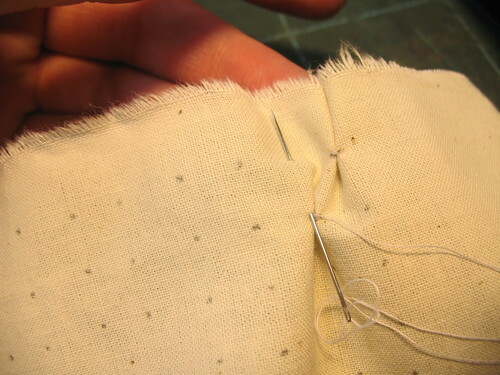 Sew some stitches and secure the “fold” you just made. There, now on to the next stage. Stick the needle down from where it just came from. And stick it up the dot under it. Now you are not going to pull the threads together, let it lie loose on the back. Pick up some fabric, go to the next dot and pick up some fabric there. 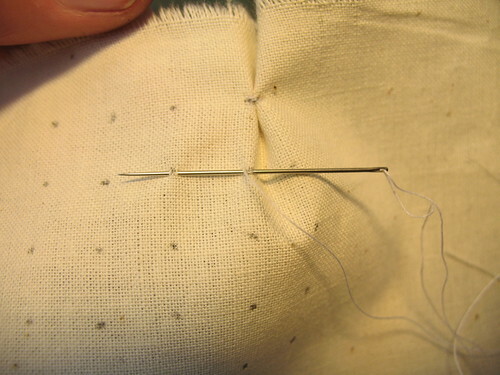 Pull together, sew some stitches and secure the thread. Stick the needle down the hole it came from again. 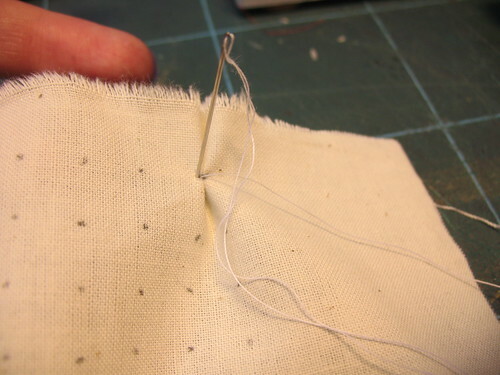 And stick it up the dot just above it, remember to let the thread on the back lie loose. And continue this way all the way to the end of the row. This is how it can look when you come to the end. 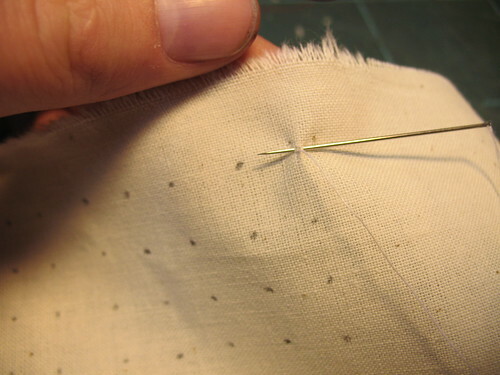 Stick the needle down the hole it came from, skip one dot and come up the next. Secure the thread. 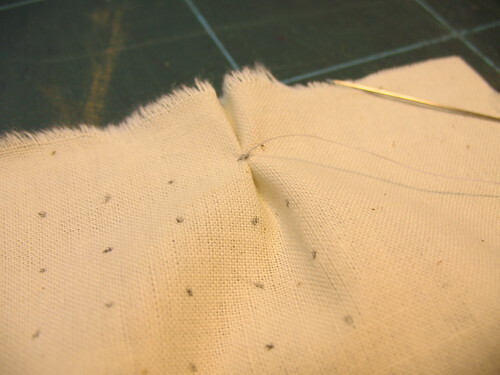 Remember that all the thread you do not pull together should lay loose on the back. 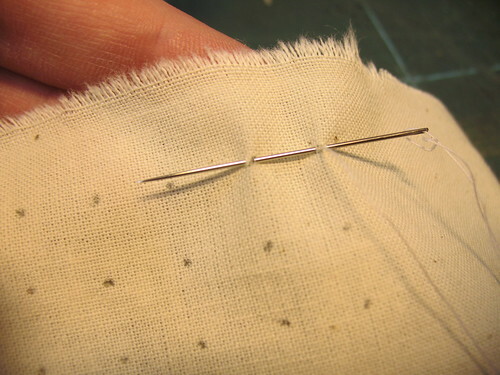 Pick up some fabric, go to the next dot and pick up some fabric there, pull together, sew some stitches and secure the thread. Down from where it came from, and then down to the dot directly under it. 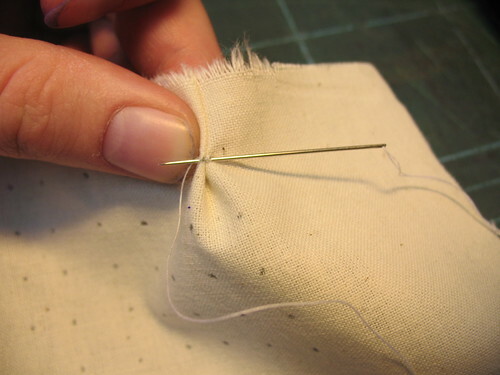 Pick up some fabric, go to the next dot and pick up some fabric there, pull together, sew some stitches and secure the thread and move on. 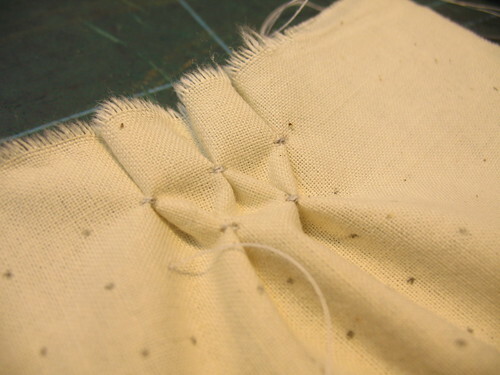 If one keeps going like this, this is how it will look like, and now you hopefully know how to make honeycomb smock. Thanks for such a wonderful tutorial. It is very helpful. I have become a follower of your webpage. The tutorials are so detailed and make everything look so easy. That is what made me think of you when trying to make a pick up skirt. Do you know how to make pick up skirts? My daughter just loves such dresses, but I don’t know how to make it, and tried very hard to find it online. Not much is available online on pick up skirts. 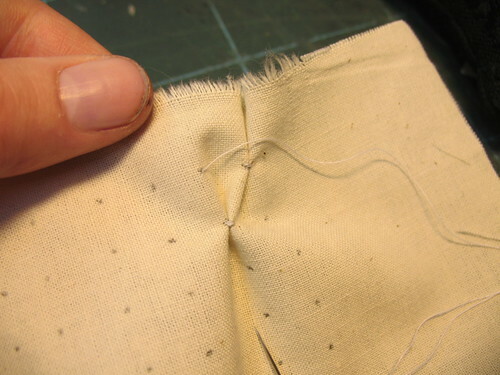 If you can add a tutorial on this topic that would be a great help for sewing enthusiasts like me. Looking forward to see what new things you are doing with scissors and fabric now. cheers from a fashion student, never really got this technique, thanks for your help! Gostei muito deste bordado. Já fiz e ficou perfeito. Tenho uma confecção de vestidos para criança em Ponto smock ” GuiguiriKa”. Depois vá ao meu blog e veja. That is a really pretty dress, and it looks so well made! That was a really wonderful tutorial.The pictures are explanatory and the honey comb is much easier than smocking.I was surfing the net for some good tutorial and I bumped into this site.Thanks a lot for the lovely tutorial.I am planning to work on a short top. excellent. now i know. i was wondering if smocking is as difficult as ironing and pleating and all that. thanks for showing us that it is easy. So, did your test piece start out 14cm X 14cm and end up 7cm X 14cm? 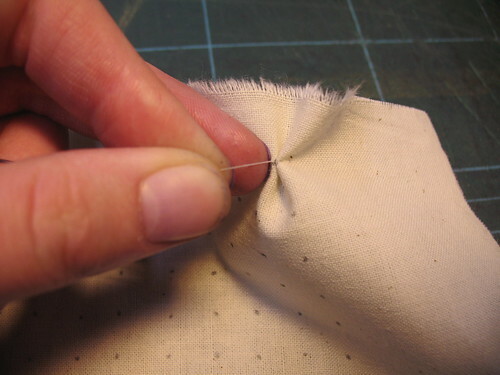 Hi, I love your tutorial, I am very new to sewing and even greener on hand sewing. How do you secure the thread? Are there different designs of honeycomb smocking? I want to make cushion covers with different designs. Any suggestions? to be honest I did not measure it before and after, but yes I do believe that it would have been reduced to 7 cm. Either that or just slightly more or less. I think honeycomb smocking is beautiful. I am glad I saw this on the internet. can’t wait to try it.I am new @ sewing, but like new and challenging things. Lovely!!! 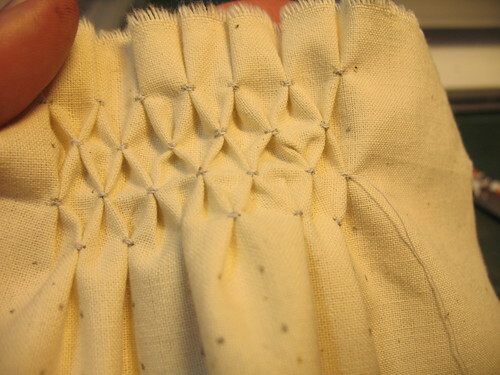 Always wanted to try my hand at smocking,and you’ve made it too easy to believe. loving it. thanks. I make historical costumes and one of my outfits has been featured here http://realmofvenus.renaissanceitaly.net/yourgarb/2010/Carol.htm I am in the process of writing up another submission for a market woman’s costume based on the paintings of Vincenzo Campi. One part of the costume is an apron that I have honeycomb smocked. May I put a link in the text I submit to the Realm of Venus web site to your very clear and detailed instructions on executing honeycomb smocking? Thank you so very much for the information on smocking. I have been looking for this information for month. It is perfect. 27. 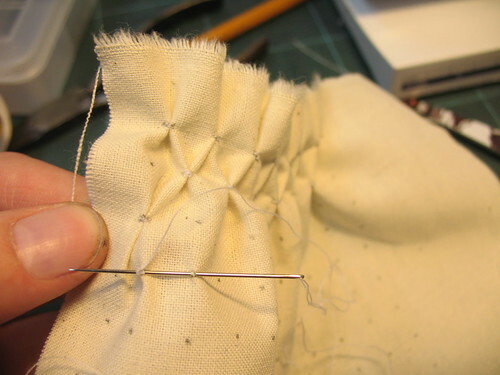 Joyce Kovacs : How much bigger you need to cut your piece to allow for the smocking depends but is usually about twice the width but nothing on the length. 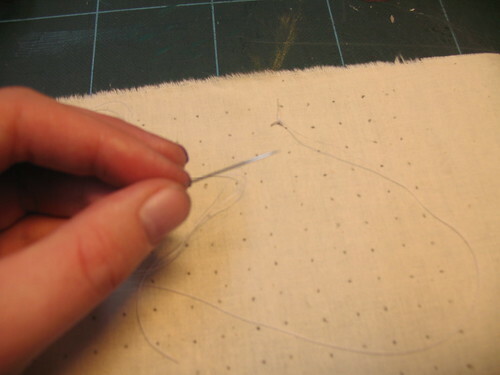 The best way to make sure is to make a test piece, make a small square and see how much it shrinks . Thanks so much for the thorough instruction. You’re an inspiration! thanks so much, this is a great tutorial….an old craft just waiting to be used in a contemporary way! what a fabulous tutorial…even I think I can do it. I want to make some scatter cushions (pillows) for my sofa and wonder if you can tell me what size reduction comes from smocking with this pattern? More than 40 years ago I did smocking using gingham, I have completely forgotten all. I was so happy to find your tut. Ny question is how do I use the gingham( larger print I believe 1 inch ?? To start. I want tomake an adult ladies hat for pool side. Small tight to he’d with about 2 or 3 inch brim? I have been searching for just this tut for the past year. Asking everyone and everywhere. And voila !! My angel with the smocking tut appeared. Thank you for your very explicit explanation and demonstration of this beautiful pattern, I’m itching to start. Thank you so much, love your blog!! Hello Cathrin. Your tutorials are absolutely perfect. Millions of thanks. I have a silly question to ask, I think it’s silly at least… If I was to do this technique for a dress, I would probably need to use elastic thread, right? 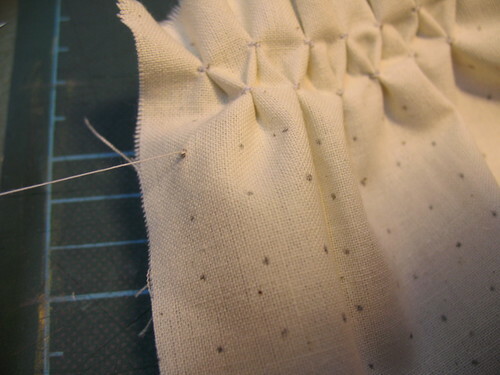 Also, you recommend handsewing the smocked part of a dress instead of using the honeycomb option of a sewing machine? 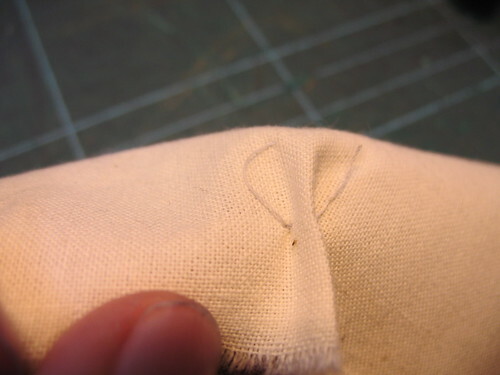 This technique gives a natural stretch to the fabric so no elastic threads are needed, but it does not spring back as an elastic thread does. It is hard to explain in words so I recommend to do a text swatch. 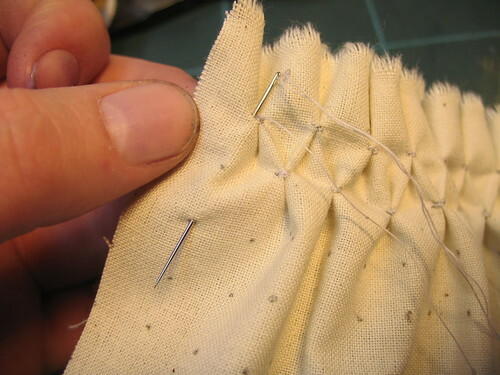 To do honeycomb by hand gives a very different look from doing it by machine with elastic threads, so it is all up to the look of the dress if you choose to do it by hand or on machine. Thank you so much. A great tutorial….thank you for putting it on white too – easy to follow. I have always wanted to know how to do this – I will try it now. Thank you so much. This was very helpful and I would like to definitely try this out. It was a good tutorial. Also I would like to learn the leaf like smocking design. This tutorial is amazing – thank you so much! I have been wanting to do this type of smocking for years and it always seemed so difficult – you’re brilliant! fantastic tutorial thank you so much! Just found your tutorial and used it to update an old T-shirt. It worked perfectly, thank you! BRILLIANT tutorial! Thanks SO much for sharing, I’m inspired to make a cushion cover with this technique now. 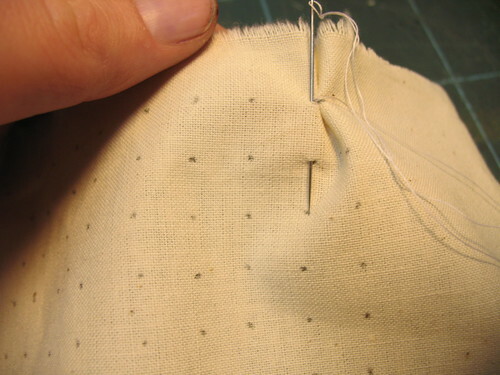 To save doing all those dots, you could have the fabric pleated at a heirloom fabric store. This has helped me a lot. Simple enough to get started. I have a machine that can do the harder stuff, but I wanted something portable to do while sitting in doctor’s offices. Thanks. 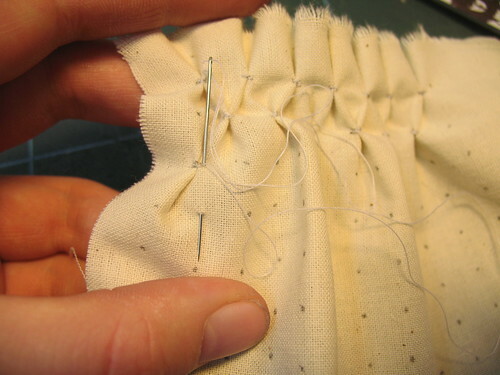 do you have to do the smocking then cut out the pattern on the material. Or, how do you determine how much material to add to a project like a baby top? 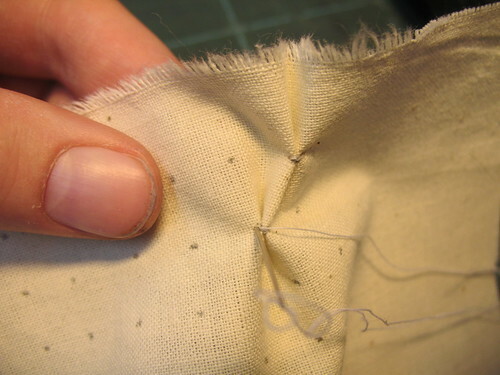 If you mark the front and sew the front won’t the marks and thread show? This looks like I should be able to give it a try. 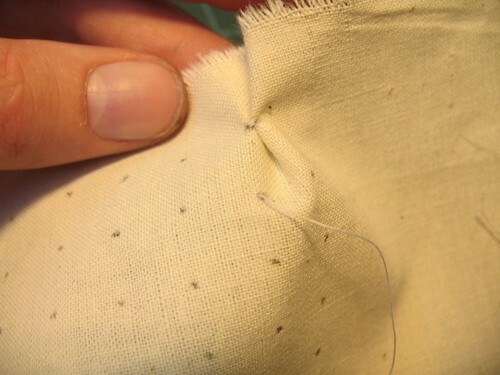 What about the loose threads on the back – why do they have to be loose? Do I need them for something later? Interesting, want to try this after exams. Thanks for the smocking tutorial. 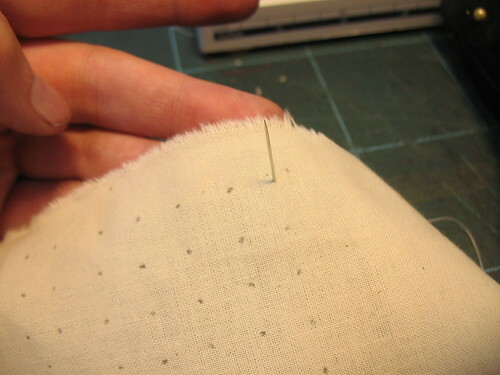 I used it for rushing the top of linen curtains that I made and it looks so professional and expensive. It is very good of you to be able to share your talent with the world. Thank you so much for sharing your knowledge and teaching me a valuable skill! Wonderful tutorial. Excellent tutorial! Very well explained, hence making it so easy to understand. Thanks! 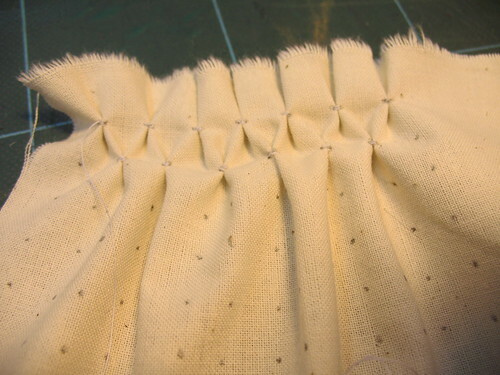 This article makes me confident to learn smocking for a dress.Thanks! Thank you for this step by step tutorial!